Once some years ago, when I was roaming the stacks at the University of Georgia library, I was struck by the titles of two books shelved side by side. One was entitled The Pre-Raphaelite Tragedy; its companion announced The Pre-Raphaelite Comedy. Though I read neither book, the juxtaposition suggested there was something gone wrong about the Pre-Raphaelite movement, or the “Brotherhood” as they called themselves. At least I’ve always seen it that way. There is too much mere illustration going on combined with a reverence for the myths and ballads of the medieval world. It is a “Pugin-esque” fantasy that has little resonance for me. Still, as my knowledge of their art was based on what I’d seen in books, I felt I owed them a first hand look. Art must be seen in the original as it was intended to be seen, or it’s really not seen at all. That is why, in the fall of 2012, being in London, I found myself in at the Tate Britain, patiently shuffling past paintings by Rossetti, Millais, and Waterhouse, drifting in a human current of school children, tourists, and pensioners. As I moved through the crowded rooms looking at the Pre-Raphaelites with their decisive colors, crisp drawing, and faux-medieval splendor, I could not escape the realization that my relationship with the Brotherhood was not improving. Art must be seen in the original, as it was intended to be seen, or it’s really not seen at all. Slipping out of the exhibition, I made my way through the general collection to arrive with relief at the Turner Rooms. The amazing Mr. Turner is always a tonic for the eye. Turner dazzles. Turner is unique and demanding and a joy. J. M. W. Turner was born in 1775 and had a long career ending only with his death in 1851. His production was continuous and prodigious. Beginning as a Romantic, he painted dramatically and even wrote a long epic (unfinished) poem entitled, “The Fallacy of Hope”. His work during this period would have established him as a great artist, but Turner continued to change, to grow, and finally challenged the very notion of what art was about. Like Beethoven, he was lauded in his own day, but came in time to make many of his contemporaries uncomfortable. Pushing the envelope year after year, pressing his use of color, dramatic gesture, tonality, and unconventional composition ever farther, his work evolved beyond the point where many of his time could comprehend it. His late works, done after he turned 60, are revolutionary even today. And being a decent sort of chap, he bequeathed a great deal of his art to the British government so it might be freely displayed. Much of it now resides in the Tate Britain. 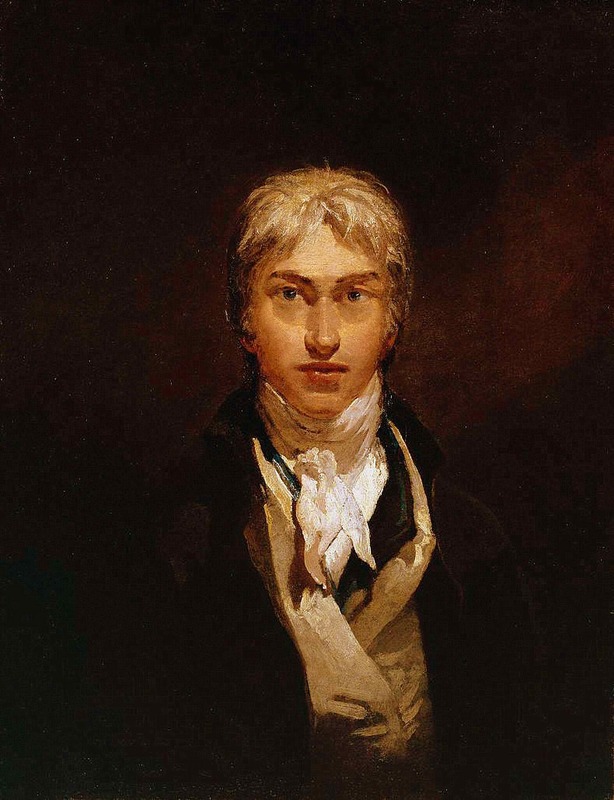 As I arrived, I met the young Turner just coming of age in the twilight of the 18th century, filled with the dramatic sensibilities of Romanticism. He was a young man on the rise, gaining recognition early, and was quickly accepted into the Royal Academy. My eye rested on Fishermen at Sea. Exhibited in 1796 to much acclaim, it was his ‘Academy’ piece, or the painting that gained him admission to that body’s august ranks at the unripe age of 27. 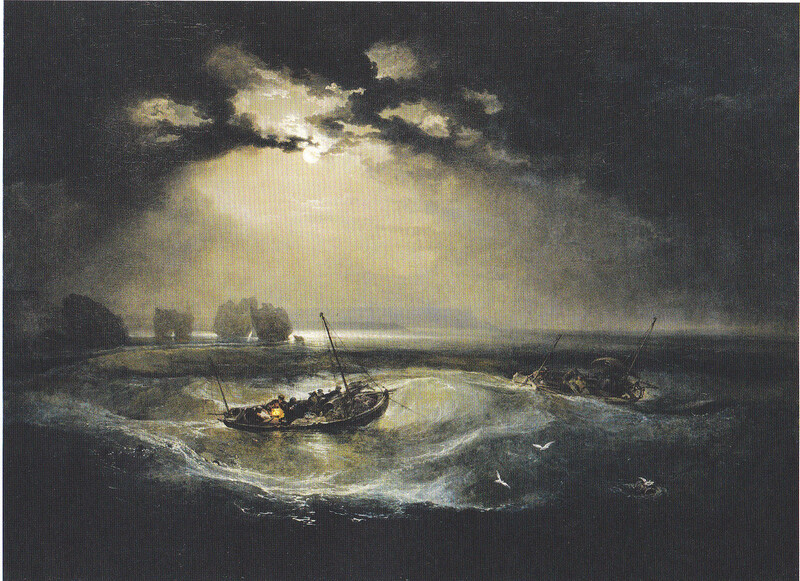 Certainly this painting expresses the Romantic temperament; we have moonlight, swirling clouds and sea, and dramatic tonality. There is no question of the artist’s talent, yet a whiff of the self-conscious is present. Turning to my left, I saw The Shipwreck. Nine years have passed. Turner shows the confidence of an assured and mature artist. The composition is brilliant, the narrative drama reaches a fever pitch, and the brushwork is virtuosic even by Turner’s standards. Little wonder the critics found it a tour de force. Over the ensuing years, Turner painted many subjects—natural, historical, and allegorical—often combining genres. Nearby is Hannibal Crossing the Alps in a Snow Storm. As I walk over, I move forward another seven years in Turner’s life to 1812. He began sketching the foreground figures in 1804, but a snowstorm he observed while visiting Yorkshire was his true inspiration. The painting was well received by the public, being thought ‘magnificent and sublime’, but something new is at work here. 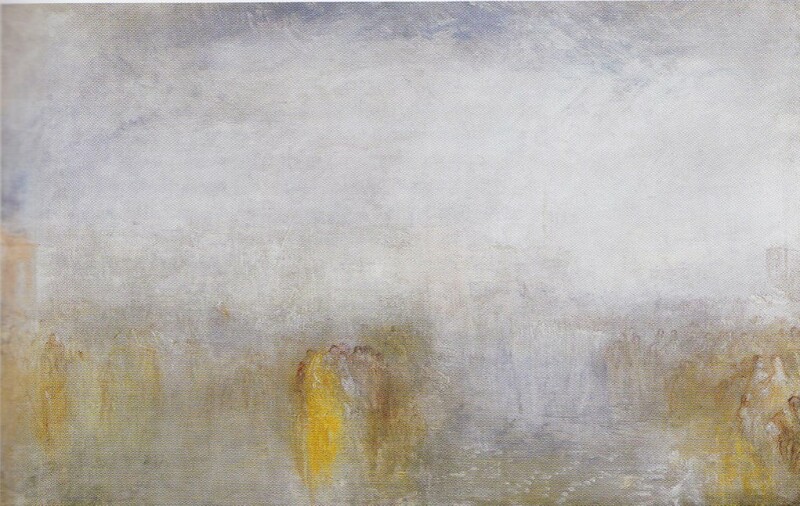 Turner is changing and this painting is suggestive of what is to come. For instance, despite the fact that he is depicting the trials of an army, the human figures are marginalized. Nature is the star player. To allow the natural phenomena to burst forth on his canvas, Turner resorts to an unconventional composition, one without any geometric order and one that throws over the traditional rules. Turner’s skill with complex compositions was the stuff of legend even then, and he taught that subject as well as perspective at the Academy. Now, as he found himself moving toward his own special vision, his old ways of thinking about painting were expanding. The battle between the idea of order and his sense of the raw power inherent in his experience of light and movement had begun. In 1817 he resigned from teaching. To see where his quest would take him, I walked over to one of my favorite paintings: Snow Storm—Steam-Boat off a Harbor’s Mouth. Turner painted innumerable subjects in his long career, but he was especially fascinated by the sea and its many, often times violent, moods. He returned to the sea as a subject again and again, his vision steadily evolving. The year is 1842. Turner is 67 years old and solidly in his finest period of painting. Laden with honors and financially secure, he is painting for himself, following his vision, an increasingly isolated and eccentric figure that all except his remaining friends suspect is mad. But he is no longer painting for his own time. He isn’t giving his audience what it wants; he is giving it what his eye demands he paint. Obviously,Turner is not concerned with the ship; he is expressing the experience itself. Hannibal Crossing the Alps in a Snow Storm showed the tension growing in him between the presentation of what is seen and what is experienced. Here experience has won out. Indeed, the ship as a subject barely exists. The swirling, maddening power of light and snow and wind is the subject. Knowing from the title that a ship is present, one guesses that the dark line is a mast and the dark passage at the top is smoke from the engines, but these suggestions are irrelevant to experiencing the image. What most viewers saw was simply incomprehensible. Subject matter as they understood it had disappeared. Turner claimed he asked the captain of the steamer Ariel lash him to the mast for four hours so he could study these atmospheric effects. The story is untrue. The tale merely reflects Turner’s desire for the viewer to understand that such a moment when light, motion, and color swirl into one is real. 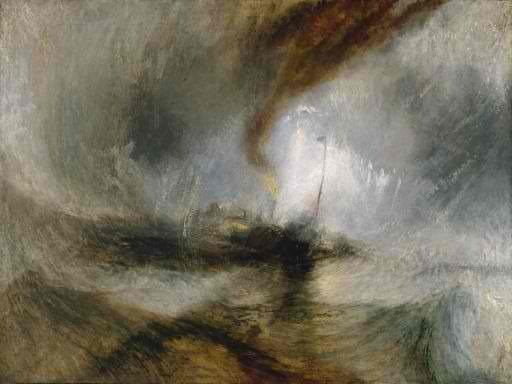 So desirous was Turner for the viewer to understand the truth of what he had experienced, his actual title of the painting is Snow Storm—Steam-Boat off a Harbours’s Mouth making Signals in Shallow Water, and going by the Lead. The Authour was in this Storm on the Night the ‘Ariel’ left Harwich. Turner was presenting an experience to the viewer. What most viewers saw was simply incomprehensible. Subject matter as they understood it had disappeared. 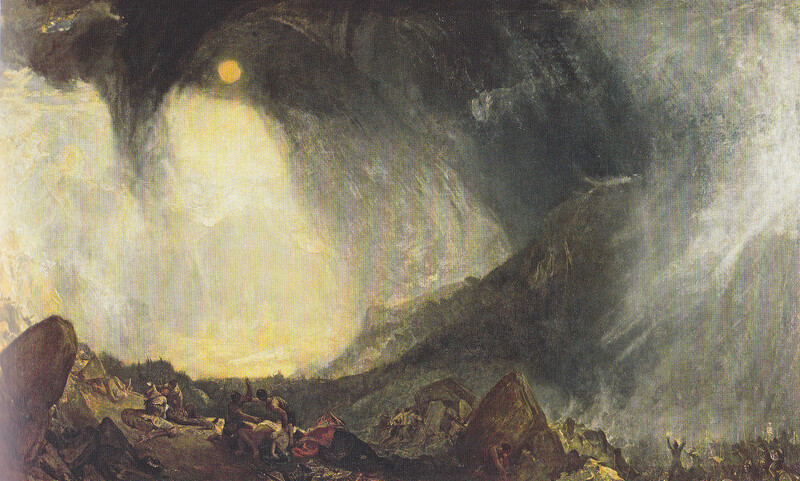 Turner’s painting was ridiculed as, “a mass of soapsuds and whitewash”. 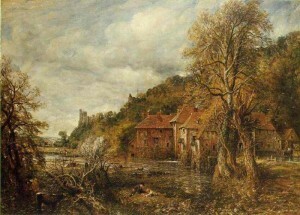 To understand how shocking such a picture would be at the time, one needs only to compare this painting to one by John Constable, Turner’s great contemporary, painted just five years earlier in 1837, the last year of Constable’s life. A few years later subject matter as his Victorian audience would have expected has disappeared from his work as is seen in 1845’s painting, Venetian Festival. It’s a festival all right, but a festival of color harmonies floating as if on light itself. 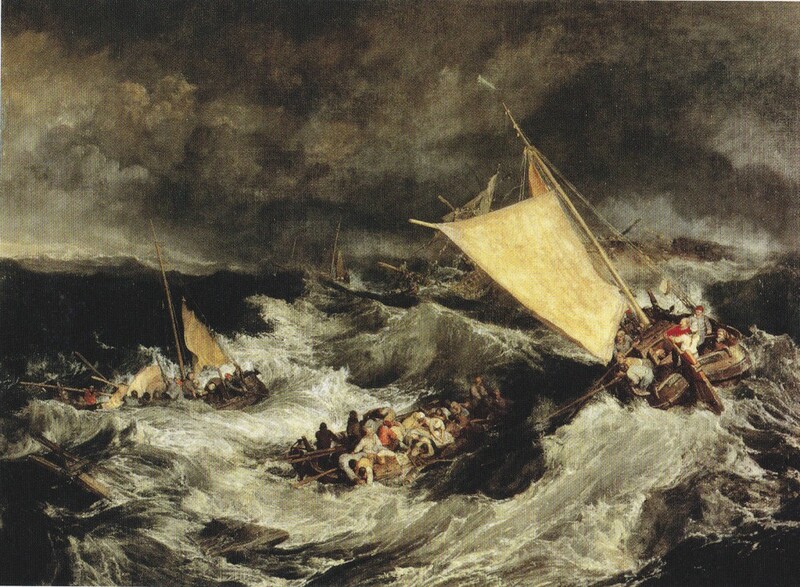 Within a few years after Turner’s death in 1851, art was to take a significant change from the traditional Realism of Turner’s contemporaries. Monet and his Impressionist colleagues would soon be at work. Cezanne would be pointing the way to Cubism. Western artists would discover and be invigorated by Japanese art and then African art. The continued development of the camera would change the way artists saw their mission. Kandinsky would finally abandon any pretense to literal subject matter. Unquestionably, the intellectual and creative turmoil of the next seventy-five years is hard to overestimate. In many ways we are still working out the implications of ideas spawned during that time. Given the immensity of the intellectual and aesthetic changes that occurred, it is perhaps a fool’s errand to look for a point of origin where these momentous changes started. Indeed, contemporary painting has had many progenitors. Still, even with that said, I would urge that The Amazing Mr. Turner not be overlooked as one of the great sources of modern art. In 1870 the France of Napoleon III engaged in an unnecessary, foolish, and unsuccessful war against Bismarck’s Prussia. It was a short sharp conflict in which the painter Bazille, friend of Monet and Renoir, was killed. Monet and Pissarro made the eminently sensible decision to relocate to London for the duration. There they were unimpressed by the dreary surroundings, painted some pictures that reflected those surroundings, and discovered Turner. Turner was not an Impressionist but he was an amazing colorist, a very daring artist, and his late work was pregnant with the future. The dramatic possibilities he poured forth were not lost on the two great French artists. I find it hard to look at Monet’s magnificent ‘Waterlilies’ series and not think of Turner. And I’ll go even further out on the limb. If Cezanne is generally accepted as the spiritual father of the Cubists and the other ‘structural’ movements in modern art, perhaps it wouldn’t be entirely amiss to say that Turner was the spiritual father of the ‘action’ and ‘colorist’ schools that would follow. Looking at the swirling intense colors of his canvases, where color and movement and form and subject melt to become one, it is possible to see the beginnings of abstract expressionism and such artists as Pollock, Twombly, Mitchell, and Frankenthaler among many others. And in Turner’s free fusing of the subject in a swirl of emotion and movement, can the vision of De Kooning be so far away? But enough. It’s easy to say too much and influences are indirect and much mutated as they filter through time and the talents of others. Perhaps it is best for us to return to that October day at the Tate Britain. It’s a curious thing, but there is a place where one can stand and see The Fishermen and Snow Storm—Steam-Boat off Harbor’s Mouth at very nearly the same time, just by slightly shifting one’s eyes between them. The effect is startling, almost disorienting. What a very great way Turner traveled and what an amazing new world he found.